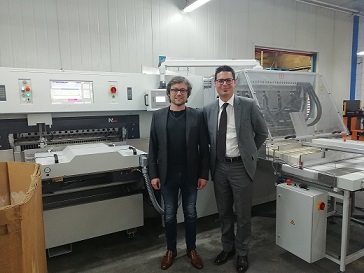 Grafiques Manlleu, Spain, purchased an SC 21 square-cut system from POLAR | Industry Analysts, Inc.
Grafiques Manlleu, a Spanish label printer located in the small city of Manlleu in the north of Catalonia, recently purchased a Polar SC 21 square-cut label system. This new POLAR cutting system consists of the loading table on the rear part of the AC 115 cutter and the automatic introducer of the stacks to the automatic bander MB 105. It is running next to two Polar DC 11 die-cutting systems. This system speeds up the output in the cutting section of square labels while increasing the quality of the products. Grafiques Manlleu is specialized in the production of wet-glue labels in both square and die-cut shapes. To maintain the increasing production volume as well as cutting quality the company recently purchased a high-speed SC 21 system from POLAR. It allowed to quadruple the square cutting productivity. Managing director Jordi Contijoch points out: “The purchase of the POLAR system was based on the outstanding performance we experienced with this brand. Mr. Contijoch said that already in times of his father the company counted on Polar technology. In square-cut label production the POLAR LabelSystem SC-21 provides maximum efficiency, because production steps are carried out in parallel mode. First of all, a POLAR high-speed cutter cuts the label material to strips, either in-line or off-line. Finishing is carried out on the automatic cutter POLAR Autocut 115, the central component of LabelSystem SC-21. The precut strips are manually positioned on the POLAR LT-S loading table, before they are pushed onto the Autocut rear table. In the Autocut 115 the strips are arranged on the rear table with their sides and front precisely aligned. After the labels have been cut, they are automatically arranged on the front table. A deloading device pushes them into the BM-105 multi-station bander. After that the row pusher takes the complete label row to the banding device. Once the packs are completely banded they are pushed further onto the delivery table and can be manually removed for packaging. The company has 68 employees and works in 3B paper size, three shifts per day. Outstanding reasons for its success are their quality, customer follow up, flexibility in terms of production planning, know-how, R&D and innovation, constant improvement of processes and materials. Its geographic area of activity comprises Spain, Portugal, the Maghreb, France, Germany and the US. There are the two mentioned DC 11 machines, the recently purchased SC 21 system and another two off-line Polar cutters. The company was founded in 1919 and is now in its 4th generation. In its first years, it was the town´s print shop. In 1992, it started to specialize in label production. This entry was posted in Uncategorized and tagged Grafiques Manlleu, Polar by IA Staff. Bookmark the permalink.